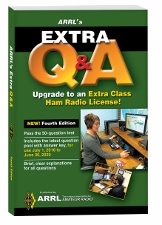 This fourth edition of ARRL's Extra Q & A is your authoritative guide to every question in the Extra (Element 4) question pool--everything you need to pass the top-level Amateur Radio license exam! With more than 700 questions included in the question pool, using ARRL's Extra Q & A is the best way to review for the exam with confidence. Use this book with ARRL Exam Review for Ham Radio to take randomly-generated practice exams using questions from the actual examination question pool. You won’t have any surprises on exam day! Instructions are included inside the manual. ARRL's Extra Q&A. Kindle Edition. The ARRL Extra Class License Manual. Includes detailed explanations for all questions.